This past month, my director was out on medical leave and I was technically acting director, if only in my mind. (To people walking through the door, I was still "probably the receptionist".) This led to my having to write down notes to remember to ask the director about when she came back, and the writing led to more ideas. Like ideas for exhibitions! Last month we also had a children's program on one-room schools, with a guest speaker who actually put the kids through their paces in writing and arithmetic. It was so popular! Making the past personal helps everyone connect to it. So what about an exhibition looking into the inhabitants of an ordinary street in a St. Lawrence County village? 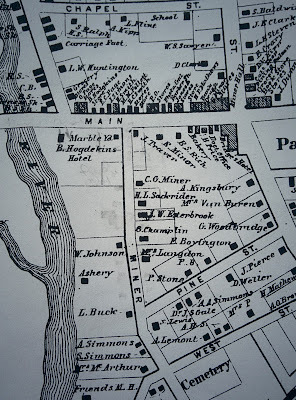 In order to tie this to Remington for the Remington Arts Festival, the street I chose in 1900 housed both a paternal uncle's family and a maternal uncle's family. The census doesn't list street numbers, though! 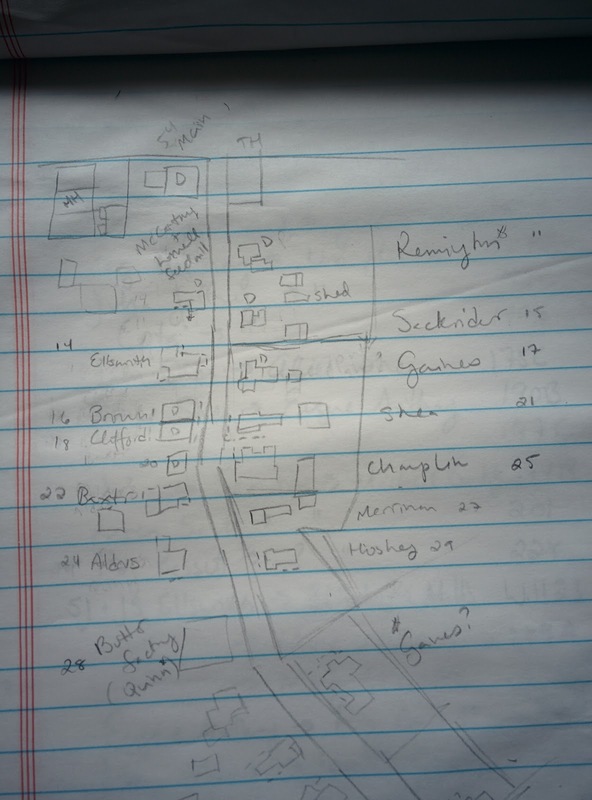 So I've been on a quest to both research about ten households on Miner St. and to figure out how these families were configured geographically. Using a spreadsheet, all the censuses available from 1880 to 1930, deed grantor/grantee indexes, and some fire insurance maps from 1898 and 1905, I have a pretty good idea. At least roughly. What this has really brought home to me - as so many things do, working in a museum - is how many ordinary things have been lost to history. "Daily life" in a general way gets a lot of press, but specific aspects of daily life aren't usually of broad interest. I don't just want to know how people shopped in the late 19th century, I want to know where people in Canton bought groceries in 1890, and who worked the counter. I want to know how the Ellsworth shoe store was laid out. 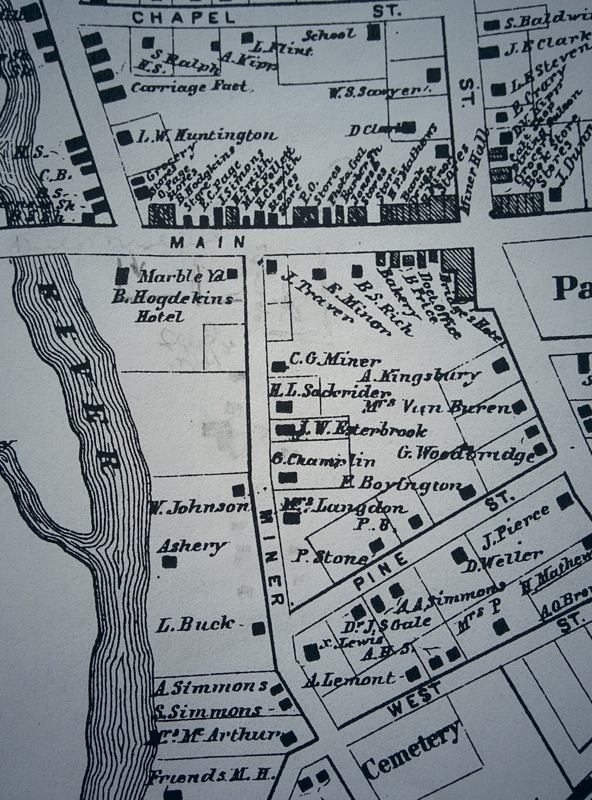 I want to know what it was like to walk along that particular main street between the American House and Hodskin House, the two hotels in town (now the site of the American Theater and the post office, and an H&R Block and a Family Dollar, respectively). And I can't! I mean, I could find out where Cantonites bought groceries, but it's impossible to understand what it was like to experience life in the past. You can do an immersion reenactment with no spectators at a contained site, but even if you could fill a larger site with progressive reenactors and close it off for a week, you'd still be a modern person, without the mindset, prejudices, and background knowledge that a person of the past would have had. Most people disparage nostalgia for a time that you don't actually remember. They say it can only come from romanticizing away the boring or dirty parts of the past and imagining yourself as a rich person. Midnight in Paris says that people have always had this nostalgia, even when they lived in the time you feel it for, so what's the point? And to be fair, the word "nostalgia" does imply a rosy view, as it's meant to be applied to the things you miss from home - anemoia is a neologism created to express never-been-there nostalgia - so maybe I shouldn't use it for this, but I think a lot of people would apply it to the feeling I'm struggling to describe that I had when I finally put together a workable map of Miner Street and short biographies of the families who lived on it. The people who lived on the east side of the street generally owned their homes, and lived there for decades - the Sackriders, the Champlins, the Gaineses. Their occupations and ancestors were fairly well documented by their obituaries, even if their personalities tended to be described only in clichés. (Men were upstanding, responsible citizens; women were good neighbors and gracious hostesses.) People on the west side along the river rented, and almost all were transient. They did blue collar work, and their death notices were short or non-existent. Ada Merriman rented no. 27 for a short period of time around 1900 while her daughter Lelia taught school and her son Leslie attended St. Lawrence University, but before and after that she drops from the record. She wasn't a local - she apparently came from and went back to Pennsylvania. She wasn't from one of the earliest families to settle Canton, and she didn't sit on the board of the bank. By many standards, she - and Nelson Brown the boatmaker, and Celestia Squires the servant, and Clara Bragdon the dressmaker - was not important. But like the Doctor, I've never met anyone who wasn't important before. So I hope that with this exhibition I can bring all of these people back to life in a small way. This will be a wonderful exhibit. But I think that some legwork would really make it stellar--or at least, it wouldn't hurt. Go to a senior citizen lunch (do they have them in Canton? In the town where I work, my elderly library volunteers walk to one at a church.) Do a little presentation. Ask for memories. Even though the people there wouldn't have been alive then, one or two probably have childhood memories that would be of help, and they'd remember someone who was old when they were young, and they just might be able to help you fill in some interesting details. Massena was also apparently a large train area, and so was heavily involved in shipping. 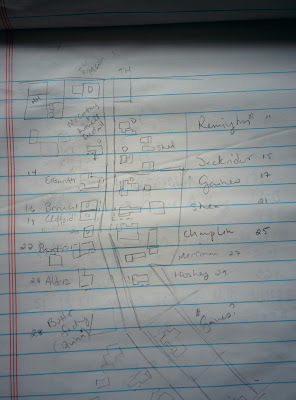 If the notes I took from that visit (2007 or so) would be useful to you, I can dig them up. And thus ends my info on St Lawrence area gossip and history. Oh, and the Julia E Crane School of Music was the first school for music ed in the country. And when she died, the people of Potsdam petitioned the state to incorporate it into the SUNY system, rather than let the school languish. NOW I'm done. See https://upload.wikimedia.org/wikipedia/commons/3/36/State_Street_-_Ithaca%2C_New_York.jpg for an example of details you can see...including using what appears to be a rain umbrella for a sunshade, signs, things going on. Unfortunately, we don't have any photos of Miner Street. So many postcards with views of Main Street! But they didn't seem to be interested in this one as a subject.